The above illustration is a composite screen shot taken from an OSCOR Green Spectrum Analyzer, showing traces from 2 NLJDs. 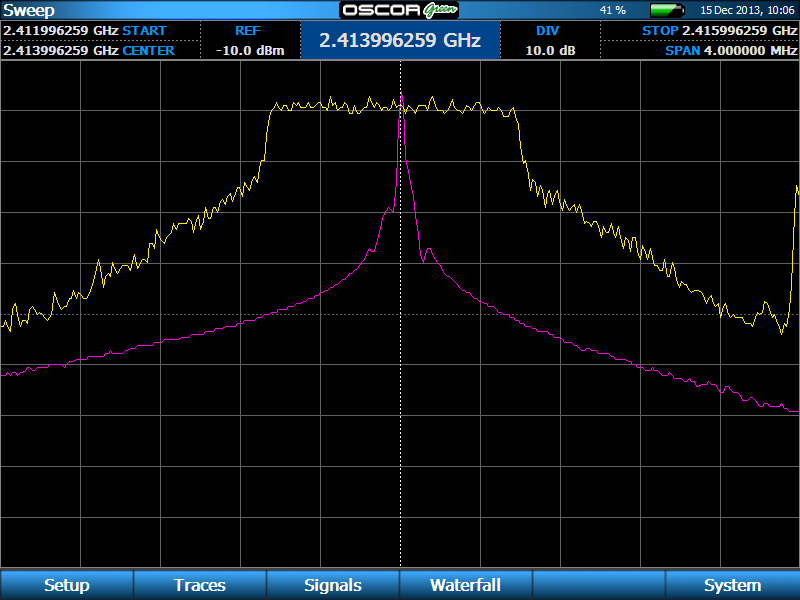 The purple trace is a commercially available NLJD transmitting a continuous wave analog signal at 2.41 GHz. The yellow trace is an ORION 2.4 broadband digital spread spectrum signal at the same frequency. The spread spectrum signal of the ORION 2.4 is almost 400 times wider than the CW signal. The spread spectrum signal puts more energy on an object at a given time. In the late 80s and early 90s, the bag phone was developed as a portable communication device, but when the next generation digital cell phone came out, the bag phone and other analog variants soon became history. Digital signal processing offered so many benefits to signal delivery, there was really no comparison. Modern digital modulation can provide higher quality signal purity with much lower noise interference. Today, practically everything is digital. A digital spread spectrum NLJD (Non-Linear Junction Detector) like the ORION™ 2.4 provides substantial advantage over older technology continuous wave (CW) analog systems in a similar way, because it provides a much greater detection range for the same power. Also, using modern high speed DSP processors and wideband digital modulation, the ORION 2.4 response time is near instantaneous. To put it into perspective, the digital processing response is achieved on the order of Microseconds. Even when increasing the DSP gain to the max, there is no discernible decrease in response time that can be physically seen or felt. than even the 3 kHz signal of the NJE-4000. Comparing the ORION 2.4 to an older analog CW NLJD is a bit like comparing the 20 year old analog bag phones to modern miniature smartphones. In modern smart phone technology, the transmission medium is based on spread spectrum digital RF modulation technology so that the performance, reliability, and coverage can be achieved at fractions of the power. The same is true of the ORION 2.4 which incorporates modern OFDM (Orthogonal Frequency-Division Multiplexing) modulation used in state-of-the-art wireless systems. When it comes to audio, the Listen Mode of the ORION 2.4 is also based on modern digital technology. Audio quality is as good as, or better than any analog CW NLJD signal. This applies to both AM and FM demodulation, and if there are electronic signatures that are within the audio bandwidth, then an audio signature will be heard with the ORION 2.4. The ORION 2.4 is perhaps the only NLJD available with both CE and FCC approval.The ORION 2.4 has also passed safety compliance testing conducted by an independent third party testing laboratory – SGS North America. The ORION 2.4 NLJD offers better sensitivity with a better detection range over other models and ushers in a new generation of NLJDs.